Chace has a pair of slippers that were given to him by a family friend when he was born, soft and cute with embroidered ducks on them. 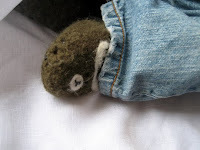 On a whim I put them on him recently and noticed that they stayed on his feet, even during naps - unlike socks - and kept his feet nice and toasty warm. 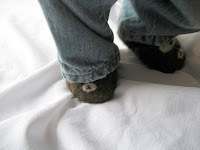 He has worn them every day since, to the point where they won't wash clean (and he's just about to outgrown them! 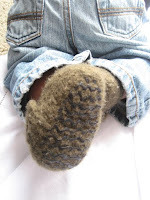 ), so I've been looking for the perfect pattern to knit a new pair (and, well, I have been on a slipper kick recently!)... not finding anything I liked I tried creating my own pattern that mimics the construction of the duck slippers. I'm not 100% happy with them yet, but with a few tweaks I think they'll work. Needle felted a moose face and antlers on them (a bit hard to see in the photos). all images, artwork, design (c) jenn maple. Powered by Blogger.